There’s a helpful saying that I’ve heard (and repeated) about the early Pentecostal movement. It states that Pentecostalism “was an experience in search of a theology.” This simply means that since there wasn’t really a “Pentecostal” category prior to the early 20th century, the experience(s) that took place during events like the Azusa Street Revival had to be thought of in newly created theological categories. Make no mistake, experience is an important part of Charismatic Theology. I’d actually argue that those who make the suggestion that experience shouldn’t play a role in determining the validity of one’s theology are often arguing on the basis of their lack of experience, which is still an argument from experience! For Charismatics, experiencing the presence of the Lord is something that can be tangible and somewhat normative (like I said here and here). For me, one of the reasons why I’m “Charismatic” is because of my experience. Some will take issue with my reason for being Charismatic in this post. Why? Because I didn’t jump right into exegesis. Don’t worry, that’ll come later. Here’s why I’m going to talk a little bit about my experience(s). When I was around eight years old, my parents started attending a “charismatic” type of church. We went from attending a hardline Cessationist church (Church of Christ) to worshiping at a very expressive church. Imagine one week going to a church that sang hymns only, had pews, was very organized and reserved to attending a church that had banners, flags, dancing, tambourines, and lots of… emotion! It was a big change! I didn’t know anything about exegesis or theological method or church history… I just went as a normal eight year old kid, somewhat freaked out, somewhat curious. It seems deceptive to ignore the fact that I may lean “charismatic” because I grew up in an environment that fostered that type of theology. Of course, as you’ll soon see, that doesn’t mean that I didn’t do some searching and questioning as I grew up. I certainly refined a lot of what I thought about the “Charismatic” experience. But I’d be naive to suggest that one’s tradition doesn’t have some sort of influence upon one’s thinking. 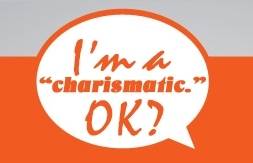 So why am I “Charismatic”? I’m a Charismatic because I have personally experienced enough to validate what I believe Scripture says happened in the NT as well as what should happen now (see, it isn’t experience devoid of biblical reflection). The first charismatic experience I ever had was when I was prayed for at that new church with banners and flags and tambourines and dancing. Again, I was a little weirded out, but curious about why everyone seemed so… so… happy! It was weird. Everyone was friendly and smiled a lot and seemed to really enjoy going to church. The church we previously attended was a perpetual Sunday morning funeral event. The first time that I attended that new “charismatic” church, I headed off to some form of children’s class all by myself. I remember being nervous, shy, and a little out of my element. Well, I only remember two things about that day. First, they had cookies at the end of class, chocolate cookies. And they were good. The second thing I remember was something that happened to be before we ate the cookies. It was of the “experience” variety. The lady who was teaching the class offered to pray for everyone towards the end of the class. I had never had anyone pray for me aside from my mom. In fact, I didn’t even know you could do that! But there she went, offering to pray for everyone. All of the kids were kind of in a line and she just went right down the line, laying her hands on each kid, praying for them. It was all very normally unnormal, meaning that even though I hadn’t seen someone lay hands on someone and pray for them, nothing weird happened. Until she got to me. What… the… heck. After it happened, I remember being a little confused as to what just happened. So a few minutes later, when the class was over, I sat there eating my cookie trying to act like nothing happened. But it had… and it was real. I saw a person’s leg grow. Yes, a person in a wheel chair who had one leg shorter than the other got prayed for right in front of me and her leg grew. It happened right in Pensacola, FL when I was attending the Brownsville Revival. I didn’t even believe in that stuff at the time, but I can’t deny that a lady in a wheel chair had her leg grow. On multiple occasions I have been on both the receiving end and the giving end of what I would define as “prophecy.” People have shared with me or I have been led to share things that the other person simply couldn’t know, or I didn’t know… through “natural” means. One time I had a dream about a lady who was carrying around a lot of hurts and pains from her past who felt like she simply wasn’t good enough to go to God. The next day that very lady walked into my place of employment and sat down at my desk to talk to me. Whoa! A few years ago, a lady came up to me during our worship gathering at the church I serve as pastor and told me that God told her that he wanted to heal some people’s eyes because there were people with eye problems. At the time the church was small enough that I literally knew every single person there and I simply knew that no one had eye problems. I felt sorry for the lady who felt that way and even more sorry for myself because I told her I’d say something about it to everyone. Well, long story short, I did… and then about seven people came forward with various eye problems and a number of them experienced supernatural healing. These are just a few of the different experiences that I have both had and seen. And they have led me to conclude that those who suggest that miracles do not happen anymore are simply wrong. Of course, all of this could be evidence that I am either crazy, a liar, demonically inspired, or some other non-miraculous explanation. It certainly could be those things. But those that know me will attest that I’m very intellectual, that I lean towards being a skeptic, and one who wants to know the truth, regardless of whether it breaks theological boxes. I want to know the truth… really. So I’m “Charismatic” because I’ve experienced both the presence and the power of the Holy Spirit on far too many occasions to assume it is merely a coincidence.